Family tradition has passed down several stories regarding how William Alexander Hesskew met Mary Ann. These stories are most interesting. Family tradition has it that William married Anne Marie almost as soon as she stepped off the boat from France. Other family stories have it that William while leading a wagon train to Texas, met Anne Marie and married her soon after. If she arrived in early 1843 after leaving Paris on 2 Nov 1842, and consummating their marriage in December 1844, the facts would suggest that Mary Ann was here for almost 2 full years before she and William tied the knot. Another version of the meeting of William and Mary has it that it was "love at first sight". The story places William working on a River boat in Mississippi and when seeing Mary Ann step off the ship from France in New Orleans, well, it was love at first sight. In fact it appears that William was living in San Antonio at the time that the Tronson family arrived in San Antonio in 1843. To tie these traditional stories together, one could surmise that William was possible involved in moving supplies from Galveston to San Antonio. While in Galveston he met Mary Ann and assisted the new pioneers that were traveling the Indianola route to San Antonio by Ox carts. He may have been the leader of the Wagon Train but we have no proof of that. It is likely that if William had not met Mary Ann before she arrived in San Antonio, that he did eventually meet her in San Antonio because they were eventually issued a marriage license in San Antonio in Dec. 1844. Many settlers used the Indianola route on their way to Central Texas. It is a natural route that follows the Guadalupe River from its spring fed waters in the Hill Country of Central Texas to Matagorda Bay, where Indianola is located. Traveling the rutted pathways of Central Texas in the Mid 1800s was a slow grueling process. Following the river from the coast would have avoided many of the problems in crossing other major rivers in Texas and provided the settlers with water and some limited food supplies as they made their way up river. Following the the river would have taken them from Indianola to present day Victoria , Cuero, Gonzales , Seguin , and then to either San Antonio or New Braunfels. The transportation of merchandise to the frontier towns and military posts was carried on by means of trains, consisting of many large wagons, called prairie schooners, each holding as much as 6,000 pounds, drawn by numerous small Mexican mules, four in a line, with Mexican drivers, all under one boss, who was held responsible. These caravans crept along slowly over the plains during the day, and at the approach of night the wagons were drawn up in an immense circle, with the mules and the men in the center. This precaution was necessary to guard against night attacks by Indians. Merchandise was conveyed west of San Antonio as far as El Paso, Texas, Chihuahua, Mexico, and Brownsville, Texas. Family Tradition states that Mary Ann Tronson while being French knew no English when she arrived in the United States. She and William Hesskew courted in Spanish as a common language since William knew no French. After their marriage William encouraged Mary Ann to learn English and she did finally, learn to speak English, but only spoke it brokenly until the time of her death it was told. Records of Stephen F. Austin, dated the 12th of January 1830, reflect a William Haskin from Alabama with other men from Alabama were issued certificates for land related to Austin's Colony. One has to ask, is this our William? At this time there is not enough evidence to say definitely yes, but William may well have come to Texas as early as 1830 to scout the perspective new lands for not only himself but his family. He would have been about 19 years old at the time. William also had an older brother, Moses who had come to Texas in 1837. They both lived in San Antonio for a short while before moving to Gonzales in 1843. William and Moses are both well documented as living in Gonzales County, Texas. William ran a ferry on the San Marcos River in the city of Gonzales while farming and ranching evidence suggest. Moses, who farmed also, lived in the Gonzales area until his death in 1880. Both raised several children to adulthood and saw several marriages take place from their descendents in Gonzales County before William moved to Refugio County after the 1860 census. Moses was elected Sheriff in Gonzales County in 1848 and later resigned the following May. While Moses was sheriff there was a Indian raid on the County. A letter written to William from Moses has survived from 1879 if you would like to read it. Recently we were provided the following information from Documents belonging to Mrs. Doris (Smith) Mercer. Grandfather Moses Heskew was born in Marlboro District, South Carolina, August 15, 1806. He came to Texas from Alabama in 1839. He died September, 1880. Great-grnadmother was Miss Polly McLaughlin. 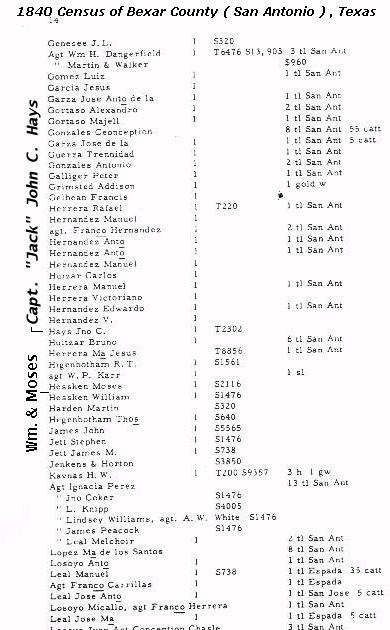 Great-grandfather was Henry Heskew. (Editors note) The name Polly seems to be in agreement with the research that left several of us with the impression that Moses's father was the same individual identified in this will. The fact that William Hesskew, Moses' brother named his oldest male child Henry might lead creedence to the fact that thier father's name was Henry. I am more inclinded to think at this time that Moses and William's father's name was Moses Horry or Moses Henry. We can begin with William's grave stone. William is buried in Brite Cemetery near Leming, Texas , Atascosa County. William's tombstone , which family members say is quite weathered , reflects that William Alexander Hesskew was born March 13, 1811. Note: Atascosa County is due south of Bexar County. San Antonio Texas is in Bexar County for a reference point on the location of Leming, Texas. Leming is probably about 30 miles south of the outskirts of San Antonio. You might ask how William ended up in Leming , Texas? I did. We might want to ask, "Where did William and Moses come from?" Census records helped out in this area. It appears the Hesskew family originated from South Carolina. 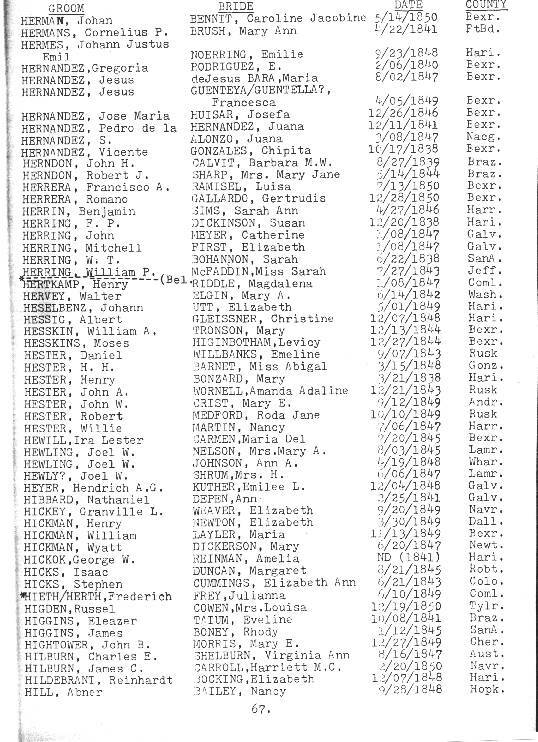 The 1850 Census list William as being from South Carolina. The 1860 Census also identifies William as being born in South Carolina, while the 1870 Census identifies William as having been born in Alabama. Evidence suggest the Hesskew family , William's parents, probably originated in South Carolina and then moved to Alabama. This would explain the discrepancy between the Census records. 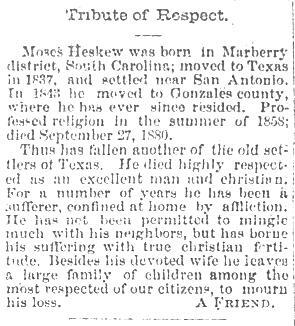 Moses Hesskews obituary also reflects he was originally from Malberry South Carolina. Scott Hinkle, a Hesskew researcher and descendant of William Hesskew, has formulated some theories on the origins of the Hesskew family. I highly recommend reading the afore mentioned theories set forth by Scott. Some family members have suggested William came from Scotland with either his family or just 2 brothers. 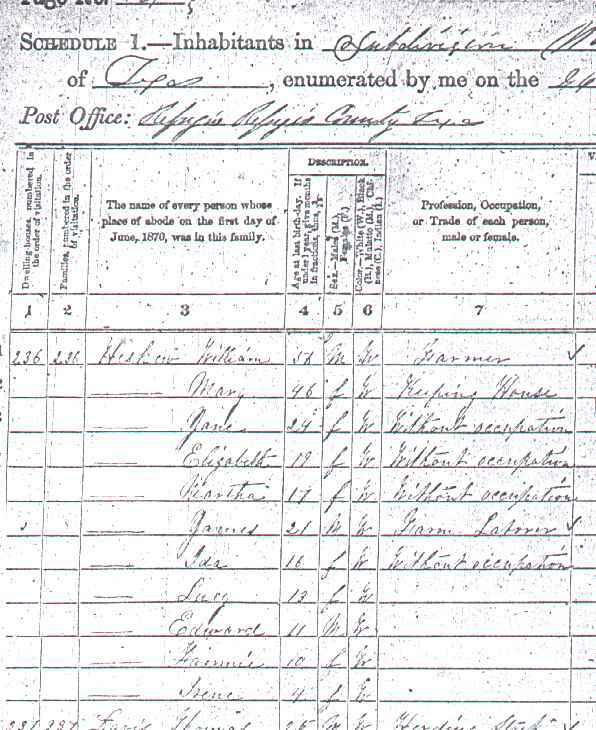 I think those stories were created when someone saw the census records that show William from SC. They, the researcher, may have mistook SC to mean Scotland. In fact SC will represent the abbreviation for South Carolina. Nothing I have seen to date validates any links to Scotland at the present time. Another relative suggested that the Scotland story may have originated with one of those mail order genealogy operations thereby producing that inaccurate information. William appears to have spent some of his early days in Texas in the San Antonio area, Bexar County, and then the Gonzales County area. He is identified in 1840 Census of Texas as a resident in San Antonio as is Moses. Both were married in the fall of 1844 in Bexar County. San Antonio, in 1845, was only a small town, inhabited mostly by Mexicans, Indians, and foreigners, with only a few Americans. It has been reported that herds of wild horses, antelope, and deer grazed within short distances to the city of old in areas now populous suburb, adorned with handsome dwellings and business. The area around San Antonio was formerly a treeless prairie, covered entirely with prairie grass almost waist high. These sea of grasses bowed gracefully to the passing breeze, and as far as the eye could see, it appeared as an unbroken calm sea, imparting to the beholder the feeling of wonder and delight. These rolling prairies were pasture grounds for immense herds of deer, graceful antelope, wild horses and the uncouth and ponderous buffalo. During the fall and winter, when the grass became crisp and dry, the Indians would start immense prairie fires that would sweep the entire country until stopped by a river or some natural barrier, leaving an appearance of utter desolation. Settlers in Texas were never with out game and must have considered the abundance of game a godsend. 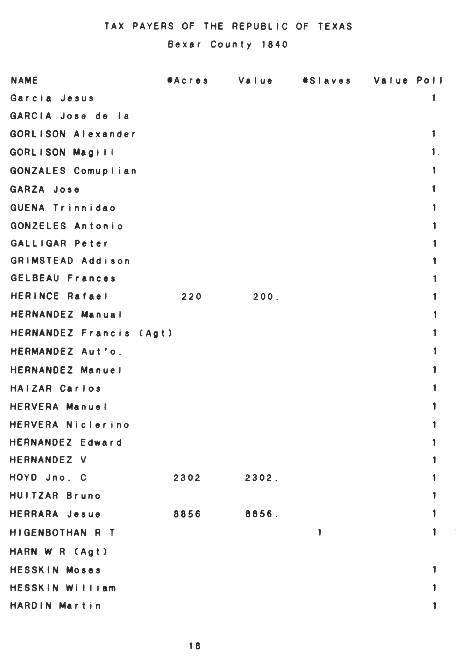 According to the "1846 Republic of Texas Poll Records" we find both William and Moses residing in Gonzales County. At what specific point they made the County of Gonzales their home is not known, but it may have been before 1846 or even before their marriages in 44. As late as the 1860 census, both William and Moses were still living in and raising families in the Gonzales County area. Moses continued to reside in Gonzales County until his death in the 1880s. The story of William Hesskew's participation in the founding of the Republic of Texas can not be told without looking at some historical facts that transpired at the time that William was first putting down roots in the new frontier of Texas in the mid 1830s. By 1830, more than 20,000 Americans were living and growing cotton in Texas on land that belonged to Mexico. These Americans had about 2,000 slaves to work the cotton, even though Mexico outlawed slavery. When the Texans' request to separate from Mexico was denied, they decided to secede. William did support the Texas Revolution and helped in the establishment of the Republic of Texas. "Now is the Day, and the hour!" On the 9th of October, the same day William joined the Texas Army, a detachment of troops under the command of General Coz arrived in San Antonio. It is likely that William traveled to Gonzales from Brazoria to join with other Texians in thier quest to be fee of the Mexican rule. The Texas army arrived in San Antonio on the 20th of October, 1835, and camped just across the river (to the east) from the old Mission Espada. By the 24th of October the Mexican Army in San Antonio was under a state of siege by the Army of the People. The Texan Armed strength was between 300-500 while the Mexicans who did not appear to want a fight had withdrawn to the Alamo in numbers between 800-1100. Stephen F. Austin, the Texan commander wished to negotiate a peaceful settlement. As the siege drew on, the Command of the troops was turned over to Colonel Edward Burleson. When the weather turned bad, the conditions in the camp became miserable. There was insufficient clothing; most of the men who had signed on for two months, had not even brought coats with them, and the food was not only poor but irregular. While many of the original soldiers began to return to their families, warm homes, and pressing affairs, other new elements were arriving to reinforce the army. There were adventures from several southern states who had heard of the fighting in Texas and were arriving in numbers. During that night the scouts reported seeing a man going into town from the camp. Believing that a deserter had disclosed their plan of attack, Burleson revoked the order and stated he was going to fall back to Goliad. On that same evening, however, three citizens of Bexar came into camp, having been released by Cos, and reported that the Mexicans were not expecting attack, and gave very definite description of the defensive work in the town. Plans were quickly made. They were to from at the old mill at three o'clock the next morning with the men who had volunteered, while Burleson was to hold the rest as a reserve. At the same time, Captain Neil was o open with two guns on the Alamo, in order to lead the Mexicans to expect the attack from that direction. At the appointed time about 300 men were on hand, with two field pieces, a 12 and six-pounder. As a result of the diminished numbers, they formed two divisions. Colonel Johnson was to lead one down Soledad Street while Milam led the other into Acequia. The two columns moved off in the dark, their paths taking them along about where Augusta Street now is to where it crosses Baltimore Avenue. Here the split, the column under Milam moving to the right and entering Acequia Street (Now Main Ave.) they entered the streets about where they now strike Navarro. They kept well abreast of each other, each dragging one of the guns behind it. When Johnson's column was within 50 yards of the Veramendi House a sentry fired at them. Deaf Smith killed him with a single shot, and all this column flashed for the house. No sooner were they inside than the Mexican garrison roared into life. A heavy fire was opened down the street and against the Veramendi House. At this time the guns of Captain Neil joined in the general uproar by firing on the Alamo, and the battle of San Antonio was on. On the 5th William was provided his honorable discharge papers. The fact that William was given his discharge papers on the same date the Volunteer Army stormed the city of Bexar leaves many questions unanswered. Was he injured after the first day of battle? In preparation for the battle, General Edward Burleson divided his small forces into three divisions: the reserve force, under the command of Burleson, to remain outside the town for a subsequent commitment where needed, and two assault forces commanded by Benjamin Milam and Frank W. Johnson. Milam and Johnson's troops were to attack the Mexican Army which had concentrated its soldiers in the vicinity of the Alamo. The plan of battle was to advance from two separate points towards the plaza , fighting from house to house. On the morning of the 5th under the cover of a diversionary artillery attack ( one gun) on the Alamo, the plan was carried out with success. On the third day of fighting, Ben Milam took a bullet in the head and died instantly. Francis Johnson took over Milams command as well as his own and the Texans, spurred by the loss of the man who had inspired them, fought on like demons. Cos began to panic. He was not used to this street fighting, nor to such blazing determination. He entrenched his troops in the Alamo mission but their nerve was gone: 179 men and six officers deserted and fled. The Texans brought up their cannon and mercilessly battered the walls. By the fifth day of fighting, December the 9th, Cos had had enough. He sent out a white flag and a jubilant Burleson marched into San Antonio to accept the Mexican generals surrender of some 1,100 officers and men. It was a brilliant victory for the Texans: so few against so many; so important a quarry at their mercy. And then Burleson let them go. He accepted a pledge from Cos and his 1100 men that they would never again fight Texans or the Constitution of 1824. Then he provided Cos and his troops with enough weapons and powder to protect themselves against Indians, and sent them marching back across the Rio Grande. The Texans courtesy to Santa Annas commander was a measure of their unwillingness to break all ties with Mexico, an echo of their repeated assurances of loyalty to a constitutional government. And though in the last 42 months they had bloodied Mexican noses some half-dozen times, they still thought that they and the Mexicans could somehow manage to get along. Indeed, with their overwhelming triumph at San Antonio, they believed that they had won their war. All Texas went wild with celebration. The Mexican Army was whipped. driven off Texan soil, and now all that remained was for Texas to establish statehood within the Mexican republic. The provisional government called for a new convention to meet at Washington-on-the Brazos on March 1, 1836, to form a more effective state government. Burleson relinquished his command; the Texas irregulars drifted back to their homes. Texas was cleared of all Mexican armies, but not for long. William, after serving for over almost 2 months in the Texas Volunteer Army, must have felt a great deal of pride along with his comrades as they helped forge the inception of a new nation, The Republic of Texas. But their victory over the Mexican Army in the Fall of 1835 would be short lived. In response, Mexico marched 6,000 soldiers to San Antonio in early 1836. An army of 187 Texans, led by Colonel William B. Travis,defended themselves from a Franciscan mission called the Alamo. There is a record of a unknown Hasken who died in the Alamo. Could this have been the legendary 3rd Hesskew brother that came to Texas. There is no family tradition of a relative fighting in the Alamo, but it is not impossible. I shall never surrender or retreat. Then, I call on you in the name of Liberty, of patriotism, and everything dear to the American character, to come to our aid with all dispatch. ...VICTORY OR DEATH. Little help came. Santa Anna's troops broke through on March 6. All of the defenders of the Alamo died. Texas did in fact win it's Independence a short time later at the Battle of San Jacinto and in gratitude, awarded various Land Grants to its new Citizens. William was also awarded a First-Class Headright Land Grant of 1,476 acres from the Republic of Texas based on an oath that he was a resident citizen of Texas in the Spring of 1836 and participated in the struggle for independence from Mexico and the founding of the Republic of Texas. 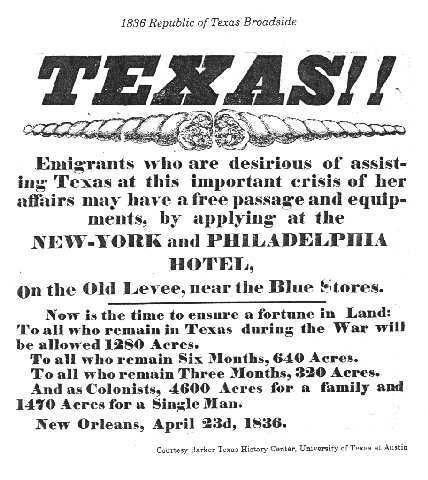 This information is substantiated in the book "FIRST SETTLERS OF THE REPUBLIC OF TEXAS" , printed first by Cruger & Wing, Printers, Austin 1841, which verifies this information. This evidence validates the fact that William was a member of the Republic of Texas Army. If you are a relative and would like to say hi or contribute to the saga, let me know here at Marvin Schubert, great great grandson of William and Mary Ann.